A new report on the Syrian city of Aleppo, published by UN investigators, accuses both the Syrian Army and opposition forces of war crimes, while no specific war crimes in Aleppo have been attributed to Russia. "The choices of methods and means of combat selected by warring parties in Aleppo governorate overall suggest a wilful disregard by all sides for international humanitarian law rules with regard to proportionality and distinction," the UN investigators' report said. Investigating the period between July and December of last year, when battles in Aleppo were ongoing, the Independent International Commission of Inquiry on the Syrian Arab Republic did not attribute any war crimes to the Russian forces. “Throughout the period under review, the skies over Aleppo city and its environs were jointly controlled by Syrian and Russian air forces,” the report titled “Special inquiry into the events in Aleppo” said. The report said that “daily air strikes” had been conducted on rebel-held areas in eastern Aleppo “throughout most of the period under review,” and cluster munitions were used, but the UN investigators did not attribute these attacks to Russia. Western Aleppo, which was controlled by Syrian government forces, had been shelled by opposition groups, it added, resulting in numerous deaths and injuries. Militants who besieged eastern Aleppo prevented civilians from fleeing this part of the city, and used them as human shields, according to the report. ”Armed groups persistently shelled civilians in western Aleppo city. Using improvised weapons, these groups often fired indiscriminately in attacks that killed and injured dozens, including women and children," the report said, adding that such attacks by anti-government forces "intentionally terrorized the civilian population." “Residents throughout eastern Aleppo” allegedly experienced “general and constant fear of reprisal by armed groups,” it said. In eastern Aleppo, rebel armed groups "established offices" in residential homes and other civilian buildings, the report said, adding that the militants "regularly appropriated residences left abandoned by civilians." The report also said opposition groups attacked the residential neighborhood of Sheikh Maqsoud in Aleppo, which constitutes a war crime. The Syrian Army has been accused of the use of toxic chlorine bombs “throughout 2016” in eastern Aleppo, "resulting in hundreds of civilian casualties" according to the report. It added that “there is no information to support the claim that the Russian military ever used any chemical weapons” in Syria. 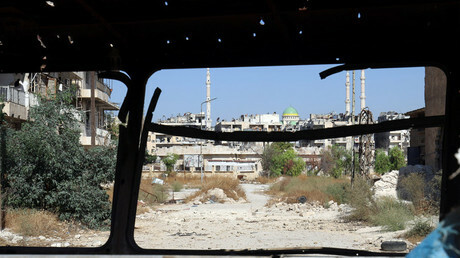 The UN investigators, who conducted their inquiry based on nearly 300 interviews and analysis of forensic evidence and satellite imagery, also accused the Syrian government of having “purposefully hindered the delivery of humanitarian aid and targeted aid workers" in a deadly air strike on a UN and Syrian Red Crescent convoy in rural western Aleppo in September 2016. 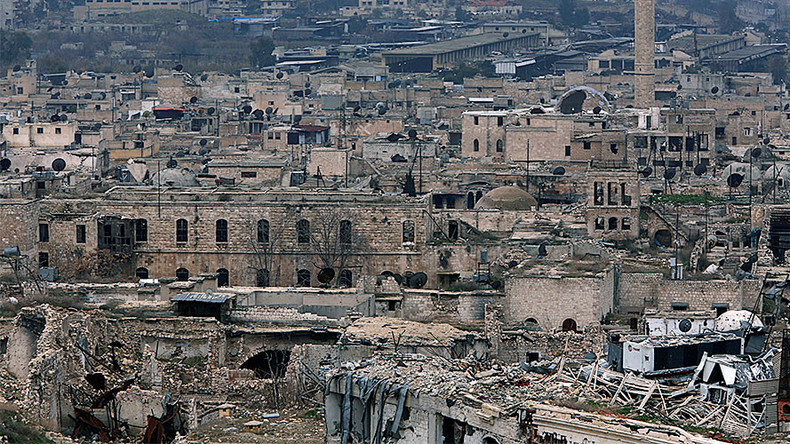 Aleppo, one of Syria’s biggest cities, was divided into government-held and rebel-held parts in 2012. Constant hostilities in the city resulted in widespread destruction and numerous civilian casualties. In June 2016, government forces launched an offensive on eastern Aleppo, encircling the area under militant control. The Russian Air Force launched a counter-terrorism mission in Syria after President Bashar Assad requested the assistance of Moscow in the fall of 2015. 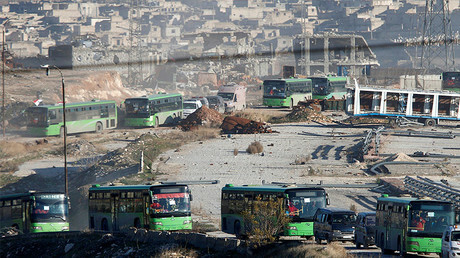 The last rebel fighters were evacuated from Aleppo in late December of last year. The liberation of the city paved the way for a country-wide ceasefire for all forces willing to observe it. "The recapture of eastern Aleppo city by pro-government forces... had an impact on conflict dynamics countrywide," the UN said, adding that the ceasefire brokered by Russia, Turkey and Iran in late December of 2016 "succeeded in reducing levels of violence and was generally holding at the time of writing."